With the free-from market growing exponentially, take a look at why expanding your milk offering is key to maximising the UK’s untapped market of coffee lovers. It’s estimated that 8% of people in the UK are lactose intolerant**, and recent research undertaken by Arla Pro has revealed that 81% of these customers would purchase coffee 20 times more each month if they were offered a wider choice of lactose free options. With quality coffee available to purchase on every high street, consumer’s standards are continuing to rise, with the spotlight on every component of the drink – especially the milk. As the top three hot drinks for UK consumers are currently lattes, cappuccinos, and hot chocolate*, milk is a key ingredient when it comes to delivering the good quality taste, texture, and appearance that consumers have grown to love and expect. When purchasing coffee, 89% of lactose intolerant consumers say milk is important to the taste, texture, and appearance of the drink. And while plant-based alternatives, such as soy and almond milk, may be lactose free, – they lack the goodness and the unique taste found in dairy. In fact, a third of consumers said that they would opt for plant-based options out of necessity rather than choice, with 58% resorting to black coffee, and 15% avoiding tea and coffee completely when dining out. A series of performance tests shows that Arla Lactofree (made from cow’s milk but specially treated to remove the lactose) outperforms existing non-dairy alternatives on the market including soya, almond, and coconut milk products when it comes to visual appearance, length of hold, implication on taste, and brightness of sheen. Making coffee with plant- based dairy alternatives can cause frustration for baristas – they can split and destroy the much-loved, carefully crafted patterns on the top of drinks. Lactofree however shows no visual difference to standard fresh milk, ensuring a high-quality finish. It steams and foams consistently with no splitting and it creates the small tight microfoam, which is required to achieve the intricate latte art that consumers love. 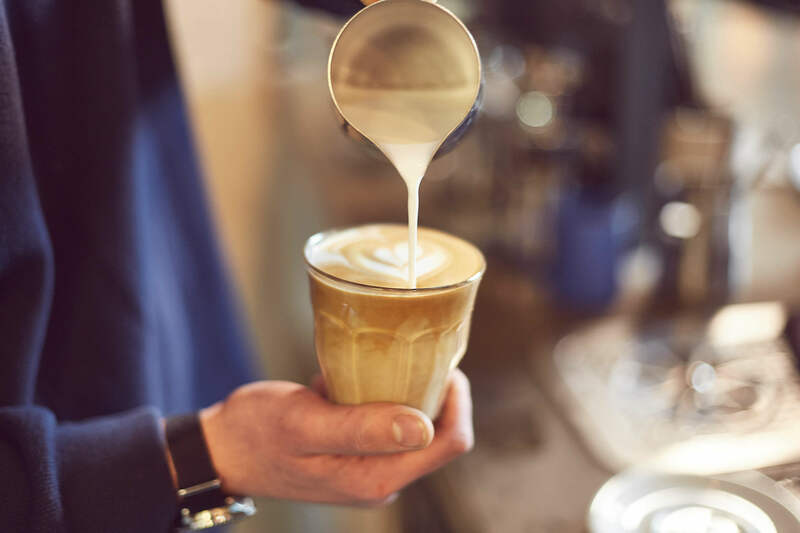 ‘Arla Lactofree gives coffee a shinier, longer lasting foam, that’s more likely to hold a pattern, so baristas can remain confident that the quality and longevity of foam won’t be compromised. It’s the ideal option for lactose free consumers, as it retains the fat and protein profile of milk, making the taste and appearance the same standard as coffee made with milk.